Grave : Plot Z. Row 6. Grave 149. Rudolf Frank was born on 18 August 1920 in Karlsruhe-Grünwinkel. His father was a shoemaker. From 1926 to 1930 Frank was educated at the Volksschule in Grünwinkel. After that he went to the realgymnasium, a secondary school. As a boy Frank wanted to become a pilot and he volunteered for military service in the Luftwaffe when war broke out in September 1939. He took flying instruction at the pilot school in Zeltweg and was transferred to Nachtjagdschule 1 (1st Night Fighter School) in October 1940. On 5 February 1941 Frank was posted to the 1. Ergänzungsstaffel (1st Supplemental Training Squadron) of Nachtjagdgeschwader 3 (3rd Night Fighter Wing). This unit was stationed near Stuttgart. He later was transferred to 1. Staffel of Nachtjagdgeschwader 3, stationed at Vechta. This unit was equipped with the C-variant of the Messerschmitt Bf 110 heavy fighter. On 9 May 1941 he flew his first mission. During the night of 3/4 July 1941 Frank and his radio operator Hans-Georg Schierholz claimed their first victory. They intercepted a Royal Air Force Vickers Wellington, which crashed north of Grafeld/Oldenburg, Germany. For this achievement, Frank and Schierholz were awarded the Iron Cross 2nd Class. On 1 april 1943 Frank and Schierholz were transferred to the 2. Staffel of NJG 3, which was located at Wittmundhafen. Here they underwent conversion training to the Junkers JU 88 C-6. On the night of 17 June 1943 Frank shot down three Lancaster bombers and on the night of 19/20 february he shot down 5 Lancasters between 01.53hrs and 05.04hrs. On 6 april 1944 Frank was awarded the Knight's Cross of the Iron Cross. On the night of 26/27 april 1944 Frank and his crew, radio operator Schierholz and air mechanic Schneider took off in a Messerschmitt Bf 110 from Vechta. They spotted and attacked an Avro Lancaster bomber over the vicinity of Eindhoven in The Netherlands. The bomber, severely hit by cannon fire, exploded and became Frank's 45th and last aerial victory. Debris from the Lancaster tore off the Messerschmitt's right wing and Frank lost control of the aircraft. He gave the order to bail out, Schierholz and Schneider parachuted to safety but Frank failed to get out in time. He was killed when the Bf 110 crashed at Heeze, 9 kilometers southeast of Eindhoven. 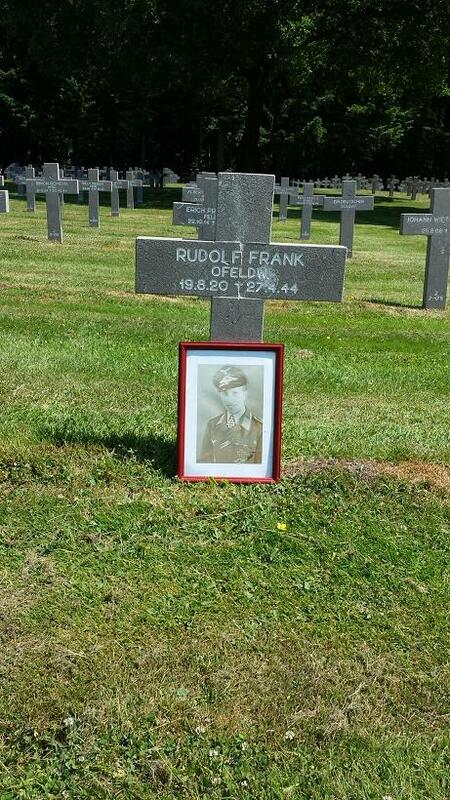 Frank was buried in the German War Cemetery Ysselsteyn. His funeral was attended by his parents, Schierholz and Schneider and some high ranking officers of the Luftwaffe. On 20 July 1944 Frank was posthumously awarded the Knight's Cros of the Iron Cross with Oak Leaves. He was also promoted to Leutnant, backdated to 1 April 1944.